Handtrucks2go is proud to offer the Escalera Staircats with online ordering. As with all of our products, we have the best advertised price! 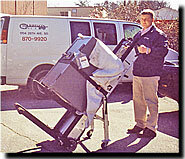 Finally a solution for moving & lifting copy machines! Get your replacement battery here! What are some of the benefits of the Escalera versus other similar stair climbing hand trucks? 6) Price Point, Because they specialize in these stair climbers they move much more volume, which gets you a much better price. Depending on the model, you will save anywhere from $500 to $1200!! Handtrucks2go is proud to be the #1 online distributor of Escalera hand trucks. Call us today for our recommendation. Will the Escalera Staircat climb all kinds of steps? The Escalera has a unique mechanism for stair climbing, and it adjusts automatically for varying heights of steps. You can ascend all the way up to a curb that's ten inches high, or you can go all the way down just a quarter of an inch high level. The operator won't have to do any kind of adjustment. It's fascinating to note that the Escalera will climb a high step at the same speed that it does a low step. There are lifting cams on the Escalera that need to come around to the point that they locate a low step. Outside of just ascending thresholds, you can also climb a big crack in the sidewalk. It will just lift the wheel up, and it will hop right over the edge. How do you manage the operation of an Escalera? The Escalera operating instructions are placed on a decal on the cross area. Just roll the hand truck to the point that the V-belts reach the step, make sure that the lifting feet come back ground, make contact with the step, move the unit back and then hit on the switch in the up orientation. To make it go down, you move the switch in the other direction. However, you have to position the wheel in the identical place it landed on the way up. Note, it has to lift the wheels up, and then it goes over the edge, and then it's on its way down. How fast does the Escalera climb steps? The Escalera Hand Truck climbs one step in six seconds, so it takes around one minute for each standard flight of 10 stairs. Do I have to be concerned about the steps getting damaged when using an Escalera? The Escalera's wheels are six inches, and they don't touch the step edges. The Escalera will land exceedingly gently on each step as it descends. There are lifting cams on the device that lift the six inch wheels up and over each edge. On the journey back up each step, they will lift the wheels up and over the edge, and they will set the wheels down in the exact same spot as they once were when it descended down in the other direction The Escalera will lift the load up and over every edge, and it will never really land on the edge. With a handtruck that's non-powered, like a normalize, the six-inch wheels would the full span all the way to each step's edge. That is the reason that you will never read about an Escalera breaking a step edge off, because it doesn't ever put any of its weight onto any step. What is the battery life on an Escalera? Once you've gone up approximately 78 steps fully on the way up, and then you've gone back down once more, the voltage will start to drop off. It will drop off very gently, and it will lose about a volt for each flight of steps. Once the battery voltage goes down, the Escalera will climb more slowly, and this will give the operator a kind of warning so that he can recharge the battery too.You can also get an upgraded battery which will give you almost double the life of the standard battery! There is a gearbox on the Escalera that is very energy-efficient, and even if it has a completely dead battery, and you don't have the full amount of power to ascend the entire span of the stairway, you will never not have a good amount of power to get back down it again, so that always puts you in a safe position. There is a regular battery that comes with the Escalera, and it's a 17 amp per hour battery too. It is a leak-proof battery that is sealed, and it can be put into any orientation, and it can also be shipped through the UPS. Will the Escalera climb on surfaces that are slippery? There are lifting feet on the Escalera that make a pushing motion straight into the step, and they use a vertical thrust to do it. The Escalera can climb up any kind of surface. You can climb onto a three hundred pound ice block, icy curb, wet tile, and waxed wood. The Escalera can even climb up onto a step made of Teflon. The slipperiest substance that a man can make is Teflon, and that's what Escaleras can climb on. The Stair Climber is very popular in areas that are mountainous as well. The reason is that homes often have several steps. 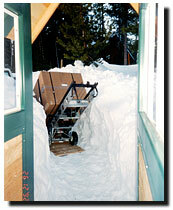 The StairClimber can go up a snow-covered or ice-covered step. There was one customer that was very proud, and he said that his Escalera could get into more places than his 4-wheel drive car could get. What else can I do with my Escalera? These units are extremely versatile. You can climb down and up steps. You can roll around on rough terrain. You can unload onto semi-trailers. You can unload and load onto vans or pickups. There are stack pallets too. You can also maneuver into tight quarters. 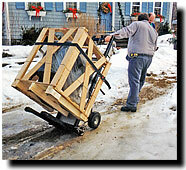 Take a look at the Escalera Moving Loads Page. How does the Escalera work? This stairclimbing gearbox is incredibly efficient. The gearbox with just three reductions can achieve a two hundred to one ratio for the gear. We use ball-bearings and hardened gears throughout the unit. The double 4,000 lb. tested lifting chains each use a separate pair of lifting feet that are made out of soft polyurethane. What should I do if I need parts for my Escalera? The Escalera hand trucks are lightweight and made with a modular aluminum construction allowing for easy replacements of parts (all the moving parts are made out of steel). All of the Escalera parts are easily replaced by the field operator out in the field, and all the part orders are usually shipped out on the same day. The Escalera StairClimber inventor had more than two decades of experience fixing typewriters, copiers, and coin machines. He made the Escalera with easy maintenance and open architecture. The full stairclimbing mechanism can be taken out for easy maintenance in a couple of minutes too. How does the Escalera balance itself? When you look at the video dissolve, you'll see that the balance for the Escalera is identical on the stairway, the same way it is on the ground. On a complete stairway, the Escalera operator has a lot of room to sit up in a comfortable position. The Escalera weight is distributed ideally. There is a balance point that goes directly through the middle of the load with a fulcrum point that is down near the lifting feet. On a small heavy load similar to the safe, you can accomplish the identical perfect balance lifting the load up on the forks. Once more, your center of gravity will go straight through the load with lifting feet and fulcrum point down by each other. Will the Escalera damage the steps? Every little thing that contacts the steps with Escalera will be soft rubber. There are soft polyurethane lifting feet, rubber V-belt glide belts, and rubber wheels. There are V-belts that maintain a touch with the step, but they don't do any lifting, and they do stop the Escalera from hurting the steps with scratches. The two lifting feet on the Escalera lay down the identical amount of pressure on the steps just like the bix six inch wheels do. The reason is that they have the same width as the wheels do, and they also have the same amount of surface area as well. It's pretty fascinating to see that a little of the older Escalera's just had one lifting foot in the center instead of the two that are on there right now. The reason that we altered it is so that the operator wouldn't need to balance the load in a direction that was sideways. There are still a number of older units as well, that are still in use, and they will work well without any damage to the steps at all. 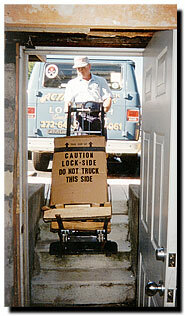 How can I load the Escalera Hand Truck into my vehicle? 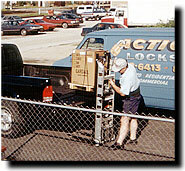 Some customers don't have a power tailgate lift, so they buy the optional portable aluminum steps. You will drill a little bit right into the tailgate inside, and the pins will go right in. There are all different sizes as well, to fit your vehicles tailgate height. Show me the different Escalera Models. 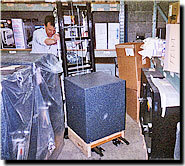 Do you need a tool to help you move extremely heavy objects like bathtubs, slot machines, gun safes, soda machines, and office equipment up and down stairs? The Escalera Stair Climber is for you then. This stair climber that operates by an electric battery motor comes either with or without a winch lift. The winch lift model is practically the same as the standard stair climber, and you have the option of getting either a non-removable, or removable forklifts. Both versions are flexible, strong, and intuitive to use. These devices were designed to hold up for a long time, and as a matter of fact we have these units in the field for more than 20 years. The list of everything they can move is extensive. 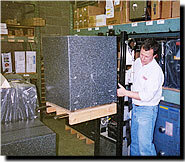 It includes speakers, lighting equipment, security safes, water tanks, and elevator equipment. The list goes on and on. These objects should give you a pretty good idea the similar items it can move though. The machine is akin to a robot in looks when it’s in use. With the removable forklift model, the winch detaches easily from the machine. The winch is created to easily fit in the slots that are part of wood and plastic pallets entailing small effort since the stair climber will do it all for you. You really have to see it in action to believe how strong it is, and how well it can move objects automatically. The operator doesn’t have to take any action to adjust it to the precise stair height either. It operates at just one speed, and it has six wheels that won’t ever brush, bang, or hit on steps, curbs, or anything else either. This device is the biggest and gentlest hand truck you’ll ever operate. It will automatically operate when it goes up and comes down to the curb, flights of steps, or whatever the situation calls for. Using your Escalera is extremely easy. Let the unit touch the step, sidewalk, or vehicle used for transporting the object. Tilt the hand truck back a little so you can get a good center of gravity going. Turn the switch one way for an up movement and the reverse for a downward movement. It will automatically operate, and it will locate the step, lift, and move it up to another step. The device will save a lot of human labor when you purchase it, and the total cost of it will be met quickly. Once that’s done with, the machine will work for many years and actually make a profit, and it will pay for itself in a short period of time. There are options that will allow you to help the device take on any task in the warehouse, outside the warehouse, on the site, or in transport vehicles too. The Stair Climber options can be put on or taken off by the operator with just a couple of easy movements. There are 11 accessories for the machine so you should have no problem finding one that works for you. The most awesome stair climber is available right now. You can purchase it at Handturcks2go.com today. The Escalera MS-and MS-1 models are very flexible, and can handle between 700-1200 pounds. It is a powerhouse! 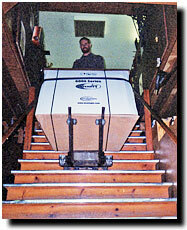 It can move your furniture, appliances, or oversized objects. Accessories are sold to make the stair climber better. Are you thinking it’s time to take a heavy load off now? Handtrucks2go.com is proud to present an in-depth look at how the Escalera can help you and your business save time and money! The Escalera StairCat Stair Climbing Forklift forklift can pick up and take down safes in and out of the transport vehicle with the hand-operated, intuitive winch. You can also use a battery-powered electric winch. The forklift is 28 inches long, and it can lift up to 1200 pounds, and it can do so at a height of more than 54 inches. You can load or unload a semi-truck with no need to load a dock and a normal forklift either. The safety strap will secure the object to your handtruck. It functions like a seat belt in your vehicle. The safety straps will rewind automatically and go inward into the sideframe if they’re not being used, so you will not need any straps idling by your feet. Install the optional BWA-1 Big Wheel Attachment by hooking the Big Wheel frame on the bottom of the handtruck side frames. Next, with one hand, push the big wheel frame firmly against the handtruck. Raise the latch to secure the Big Wheel Attachment to the hand truck. The BWA-1 Big Wheel Attachment allows you to roll on four wheels across many types of terrain, including rough terrain such as gravel, grass, dirt or light snow. If you need to move small, weighty safes, you can increase the center of gravity by heightening the forks, making it much easier to hold back the load. You can also put your feet on the wheel axle to help in moving the load back, and an operator can balance it easily when he is tilting it back. The safe weight will be centered evenly over the wheels. If you center the load, it makes it much easier to maneavuer it when it’s on the ground, or you are climbing up the stairs. This battery-powered stair climber will climb more than 130 steps with a bulky load, and it is extremely gentle when it’s on the stairs too. The forklifts are sold in conjunction with the climbing system or without it, and with a hand operated or electric winch for lifting and lowering the forks. The 28" long forks can lift loads up to 54 inches high. This is high enough to load and unload a semi-truck. It's also great for raising a piece of equipment to the perfect height while working on it in the shop. The forks have a space of 15 ½ inches apart for moving loads on or off the pallets. 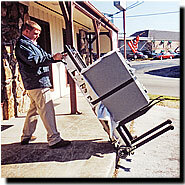 The swivel casters that are mounted underneath transform the lift to make it highly maneauverable in small spaces, and you can use an attachment to help you go over difficult terrain too The safety strap will hold the load fixedly on the handtruck for nice transport, and it will stay attached on the machine for fast and simple use. 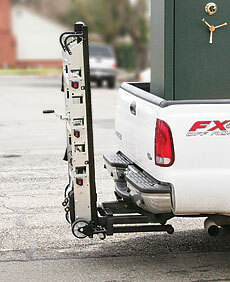 You can even get the lightweight metal portable climbing steps for getting in and out of trucks. There is a lift-hitch for taking the lift on the end of delivery trucks and service trucks too. You can deliver objects in the most extreme locations, climb curbs with ease, roll over rough terrain like gravel, grass, dirt, bumps, and hills, one person can climb the stairs with ease, you can turn tight corners simply, stack safes in the warehouse to save space, and hold large boxes and pallets too. Not sure which Escalera model or accessories you need? Watch this video! Watch this video to see customer testimonials from past Escalera business owners like yourself. We have more in depth videos of the escalera on their product pages. Click here for the standard Escalera, or here for the winchlift model. Have a look at some of the ways people are using Escalera StairCat Stair Climbing Forklifts to help them safely move safes, boilers, and other equipment! Now 1 person can do what use to take 2 or 3. 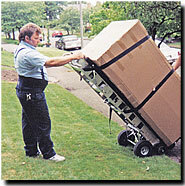 Use it as a stacker to load and unload the equipment to your vehicle up to 54 inches. Even works in the snow! Use our Big-Wheel attachment for rough and bumpy surfaces, like grass or asphault. Use the forks to rase your load to the perfect height and the RLS for further support on level surfaces. Turn tight corner with the with the lift model on its swivel wheels. Use it as a stacker for your truck, shop, etc..
Handtrucks2go.com offers the best pricing on all Escalera Stair Climber Hand Truck!